TGIF - yes, I am SO thankful it is Friday! Thank you for hopping by on the Festive Friday Blog Hop! Terri Sproul hosts the hop the 2nd and 4th Fridays of each month to showcase Christmas Cards. There is a list of the participating blogs at the end of this post, I hope you'll take the time to visit and enjoy the festivities! This card is made using the emboss resist technique. I stamped the Branching Out tree in Marina Mist and Versamark on White cardstock, and embossed with Clear embossing powder. The snowflakes from the same set (Branching Out, retired) were stamped in Craft White ink and also embossed with Clear embossing powder. I used a sponge to apply Bashful Blue ink to my scene, and then stamped the Real Red bird image (also from that set). Then the tree scene was mounted onto Marina Mist and Bashful Blue cardstocks, rounding the corners on all layers. Whew! And that was just the center of the card! 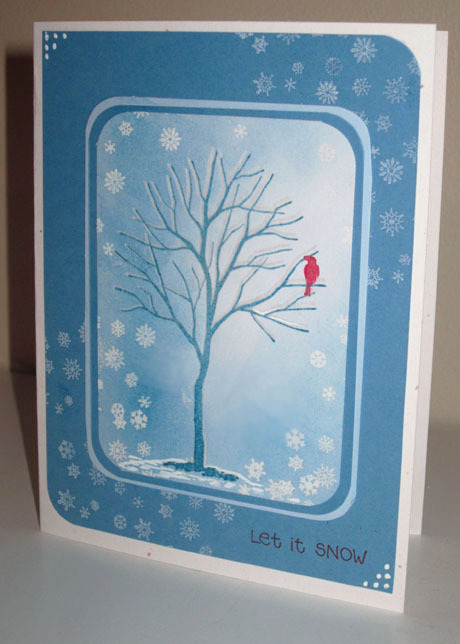 The same snowflake stamp was used with the Craft White again, to stamp across the Marina Mist cardstock on the card base, and embossed with Clear powder. I stamped the sentiment from the Punch Pals set onto the bottom of the card, and added some white accents with a Signo Gel Pen. And then I called it Done! This set is retired, which is a shame - its quite lovely I think! However, you could use this fabulous technique with any of the available winter sets, it makes for some striking snowflakes! Please continue to add to your inspiration as you hop along with us, and visit all the lovely blogs participating! Next on the path is BRENDA. Enjoy!! This is stunning. I just love how it has a simplicity and yet a complexity about it all at once.